It’s time to take control of time itself, with the Doepfer A-188-1 Bucket Brigade Device for Modular. Bucket brigade delays are an evocative sound of late-’70s electronic music. By passing the signal along a line of capacitors, the sound is delayed in time, but also degraded with high- frequency loss and additional noise (as well as noticeable sample-rate reduction and aliasing at high delay times). This creates a warm and dirty sound, much sought after at the time, and still loved as a creative effect despite the practical disadvantages a BBD unit has compared to more versatile, cleaner digital delays. Not only can this kind of delay produce tight slapbacks, grungey echoes, and smokey ambi- ence, but by exploiting high feedback and very short delay times Karplus-Strong style plucked string synthesis is also possible. The length of the delay line – the number of buckets in the brigade – has a significant effect on the sound and capabilities of the effect. The hardware module is available in six versions, each featuring a different number of stages (128, 256, 512, 1024, 2048, and 4096). But Sof- tube’s software version contains all six, and can switch between them with one click. In a sense it’s six modules in one. Ultra-precise model of rare and exciting style of analog delay effect. Can be used within synth patches in Modular, or for processing external audio in Modular FX. Six different models in one module. Great for dirty delays, sharp slapbacks, whooshing swirly ambience, or utter craziness. Build your own flanger/chorus for guitars, drums, or any other audio source. 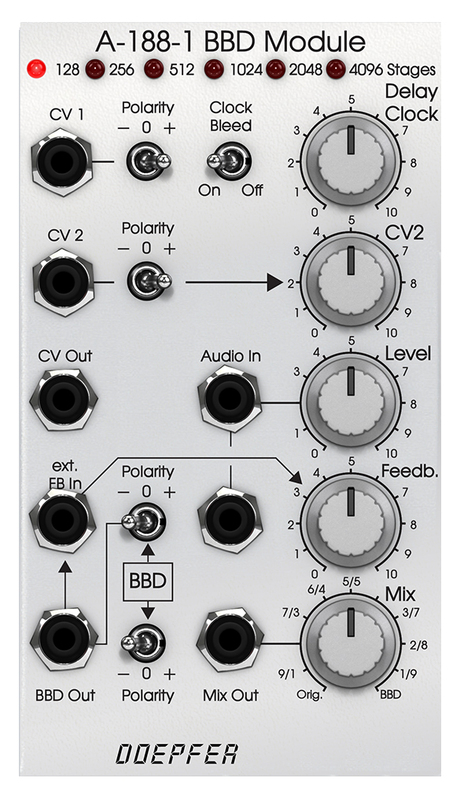 Take advantage of the disadvantages of this special design – use the BBD as a bitcrusher or distortion unit. Keep the original noise bleed, or simply switch it off.